*Please note that I have no affiliation with Blue Apron, and I did not receive any gifts, money, or any other type of compensations for writing this post. All thoughts and opinions are my own. 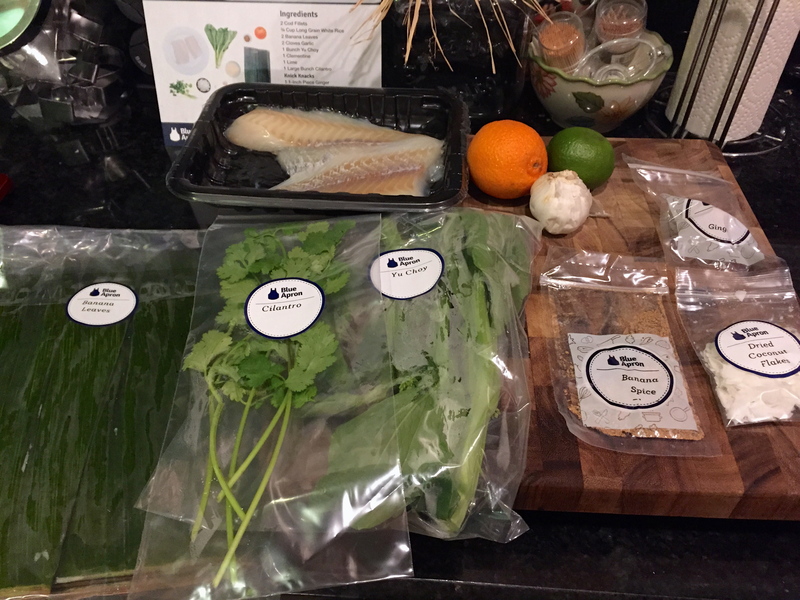 I recently tried out Blue Apron, a meal kit service that delivers ingredients and recipes to your house, and I wanted to share my experience. Fun fact according to their website: French apprentice chefs wear blue aprons, which have become “symbols of lifelong learning in cooking.” What a perfect name for the company! Anyway, on to the pros and cons of Blue Apron . . . Pro: Delivery. I was a little worried about the meat, fish, and poultry staying at the correct temperature while it was sitting on my porch, but everything worked out well. The food arrived on time and was kept fresh in its packaging. Bonus points: you get to keep the super cold icepacks inside. I definitely plan on reusing those. Con: Packaging. There was SO much packaging. If you’re environmentally conscious, be prepared for the amount of waste. Some of it is recyclable, but I still ended up throwing a lot wrappings in the trash. Pro: Less food waste. 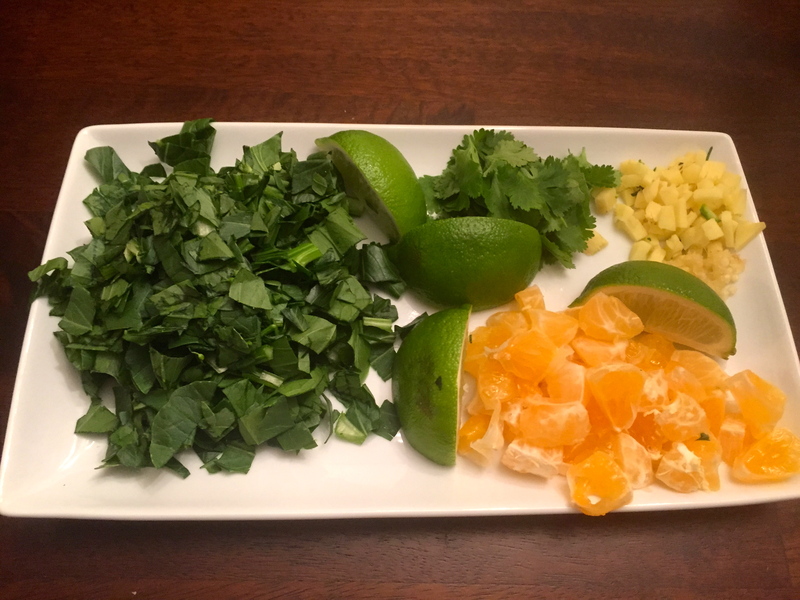 In contrast to concerns about the package, the ingredients are perfectly portioned so that you don’t end up throwing out a bunch of cilantro or something because the recipe called for a tiny amount. Pro: Recipe cards. The recipes cards are great! They include a brief intro about the dish and list the ingredients, estimated calories, and estimated cooking time on the front. Pro: Recipe cards (continued). The back of the cards include step by step directions with pictures! I love having these cards so that I can make my favorite meals again. Pro: High quality, fresh ingredients. 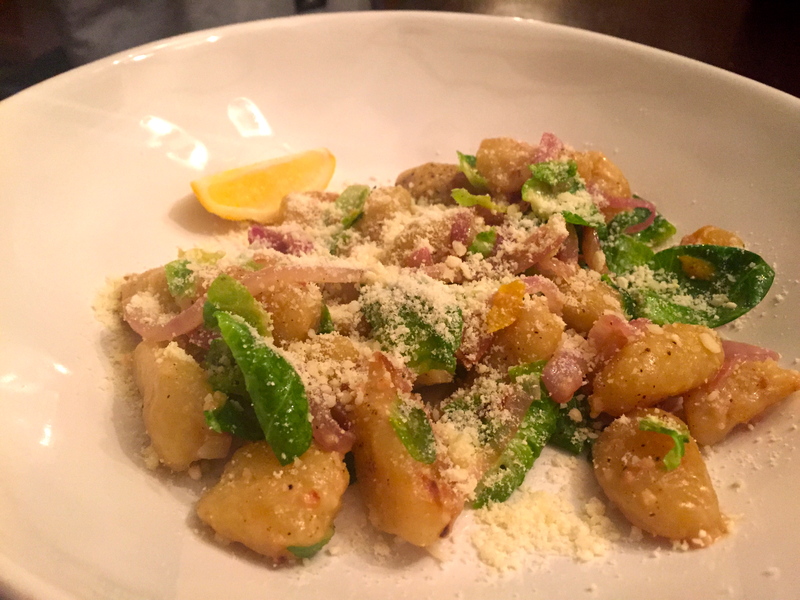 All of the ingredients I received for each meal were fresh and delicious. I was especially pleased with the quality of the proteins. The labeling was great too because I had never used some of the ingredients before. Con: Prep and cook time. 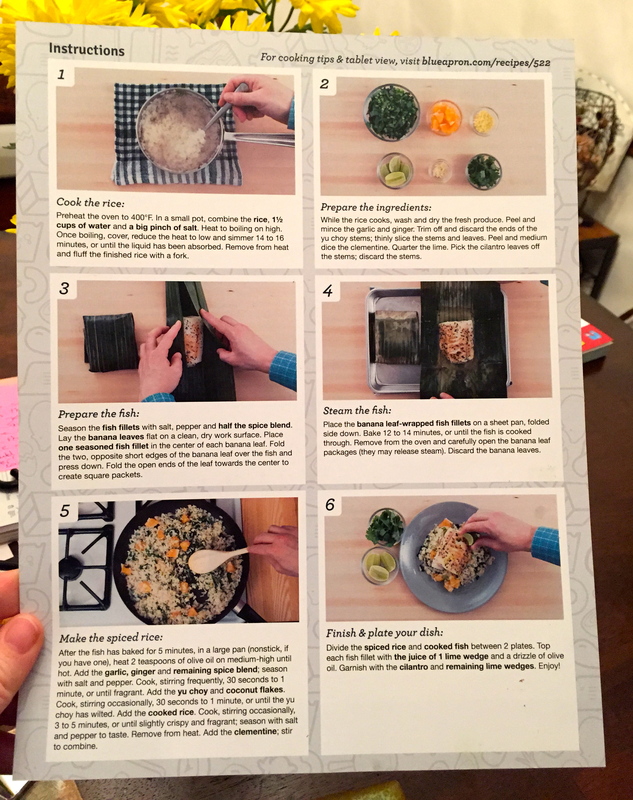 The meals I received from Blue Apron took forever to prep and cook. Ok so by forever I mean about an hour. But I really don’t have an hour just to cook dinner during the week. The estimated cooking times are way off in my opinion (unless you’re a professional chef or something). It’s more of a weekend cooking project if you’re an amateur like me. Pro: Trying new things. 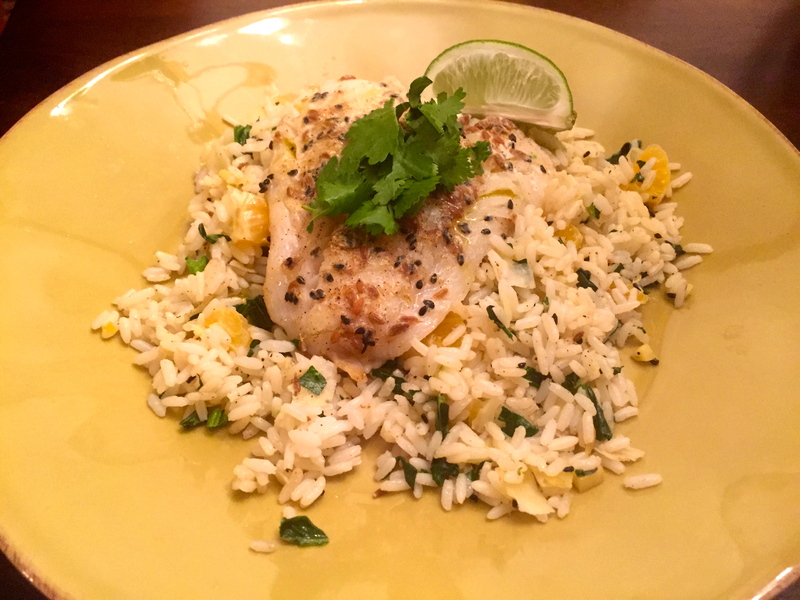 The Blue Apron meals had me trying all sorts of new things. 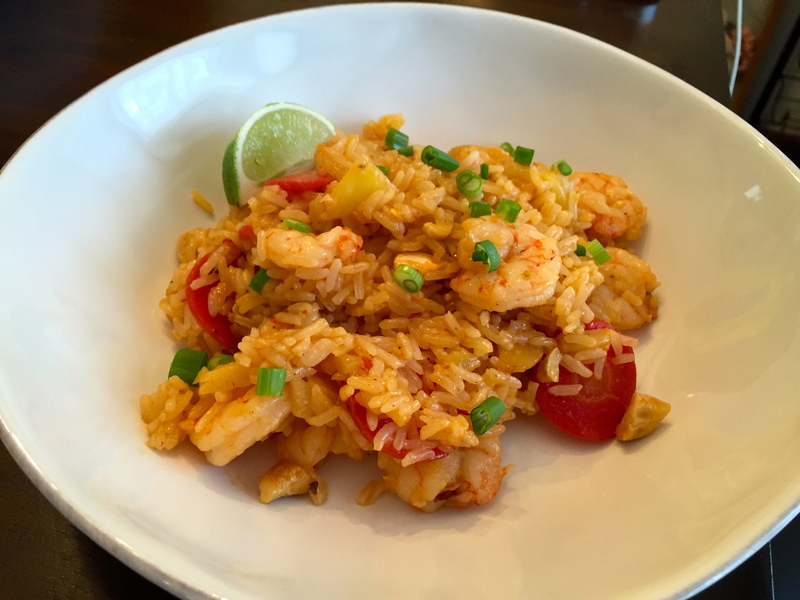 I tried recipes from different cultures and regions that I’ve ever cooked at home before such as the Southeast Asian dish featured in this post. I also tried new ingredients and cooking techniques. 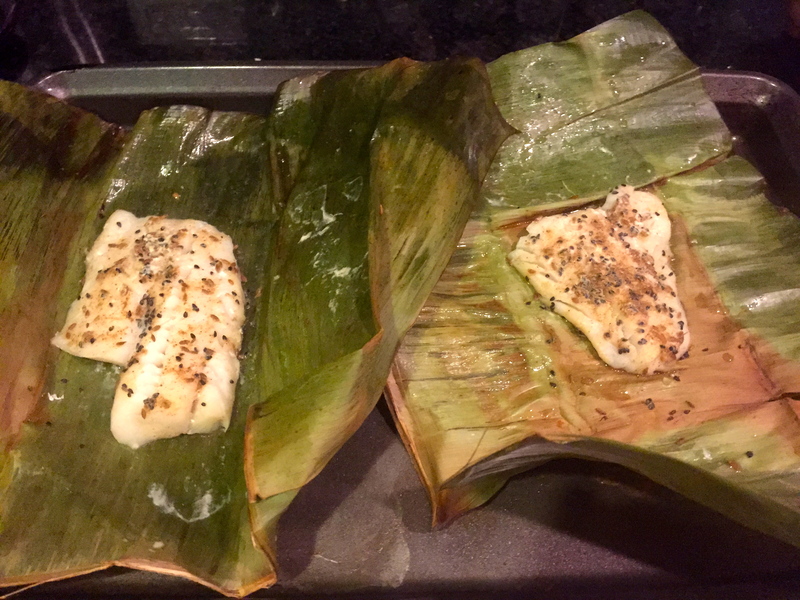 For example (see below) banana leaf-steaming cod. I never would have thought of that or tried it on my own if it wasn’t part of Blue Apron. Pro: Variety. I didn’t get pictures of every meal I tried for the few weeks I tested it out, but I wanted to share a couple more of the meals I made. Please see the meals below. It’s also important to note that you can specify what types of meals you do or don’t want in terms of dietary preferences. For example, you can let Blue Apron know that you don’t want any meals with red meat or you only want vegetarian dishes, etc. I didn’t put in any special restrictions because Derek and I eat a little bit of everything. Pro/Con: Price. The price issue depends on how you look at it. The 2-person plan costs about $60/week and includes 3 meals which comes out to $10/meal per person. Considering the quality of the ingredients and cost of delivery included in that price, it’s really not bad at all. It’s still cheaper than eating out for those meals. However, I suspect most people are like me and spend far less than $10/meal per person with grocery shopping and meal planning. I spend about $80-90/week on groceries to cover all of our meals except for the 2 that we eat out each week, so spending $60 on three dinners doesn’t make sense for us financially. Con: Subscription. 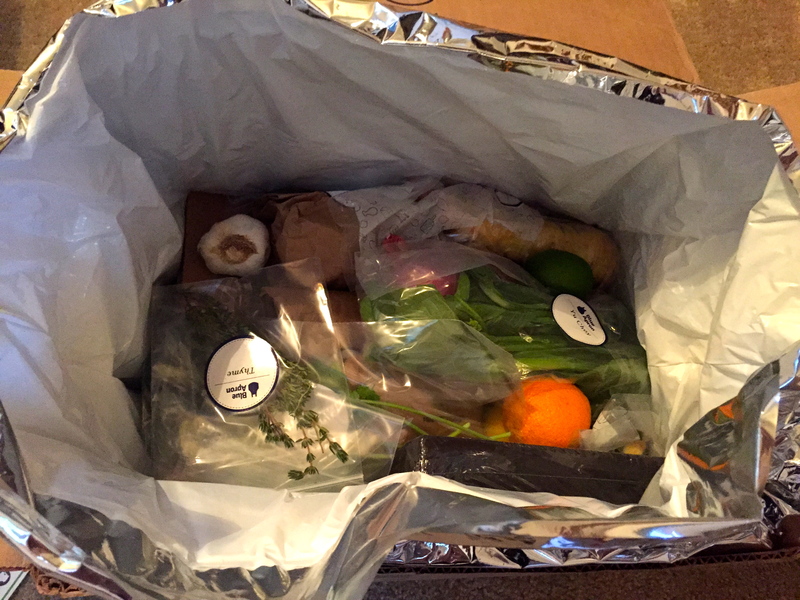 Word to the wise– Blue Apron is a subscription. They will automatically continue to send you food weekly unless you opt out, and you must opt out of the deliver at least 1 week in advance. 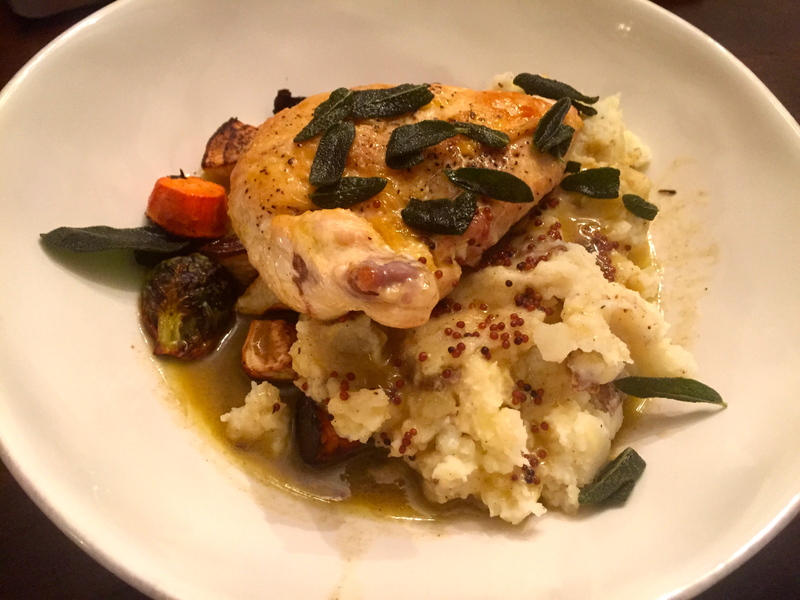 This is how I ended up doing Blue Apron for 3 weeks instead of 1. It’s my fault for not checking into it more closely, but it can definitely be a little tricky. According to the website, you can go up to 6 weeks without a delivery. Pro: Fun. 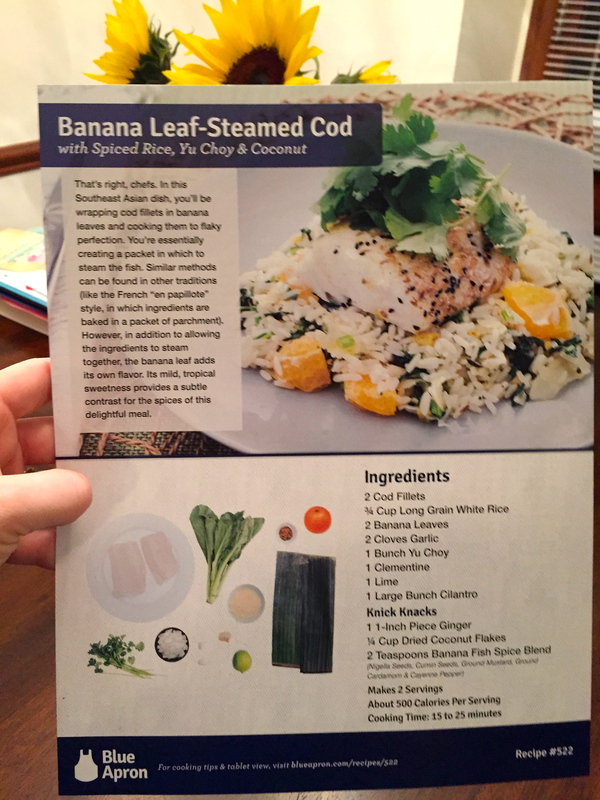 If you like to cook, Blue Apron is really fun. I especially enjoyed cooking the meals on the weekends when I had more time. 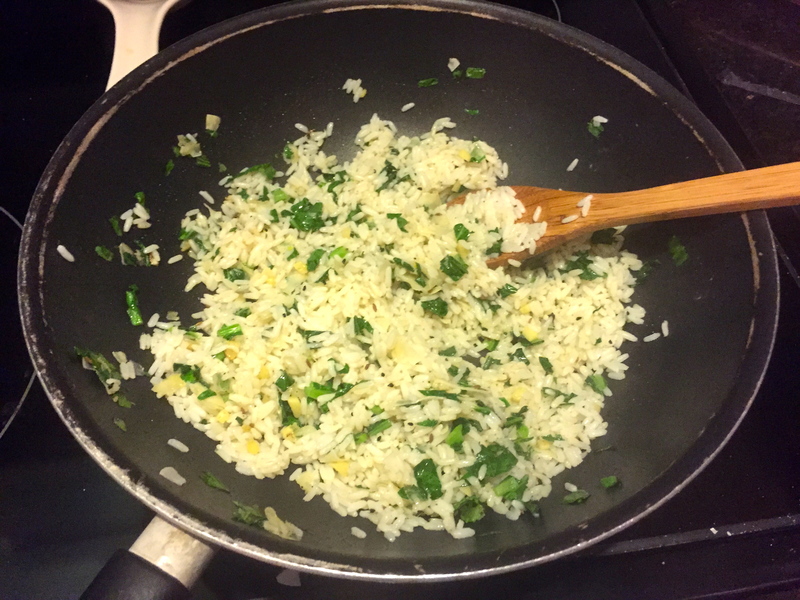 I loved trying out new foods and techniques, and it was exciting to receive everything you needed to cook without having to go grocery shopping. Though I truly enjoyed the experience, I will not be subscribing to Blue Apron. 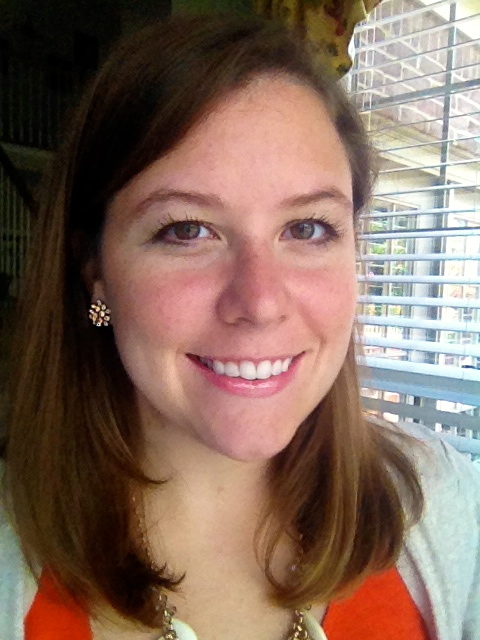 From a financial standpoint, it does not make sense for me to use the service often. I was also scared off by it being a subscription. I’m afraid I would forget to decline the meals and end up spending way more than I intended. I do, however, plan on reactivating my account every few months to try it out again for 1 week. The ingredients are seasonal, so I’d love to try it in the spring, summer, and fall; it’s just not something I want to have to do every 6 weeks.